Anterior (front) view of the skull showing the places where muscles attach. 1, 2, 3, 4. Orbicularis oculi. 5. Levator labii superioris alaeque nasi. 7. Zygomaticus minor (from zygomatic bone). 8. Zygomaticus major (from zygomatic bone). 9. Levator anguli oris (from maxilla). 10. Zygomatic process of maxilla. 11. Masseter, from zygomatic arch. 12. 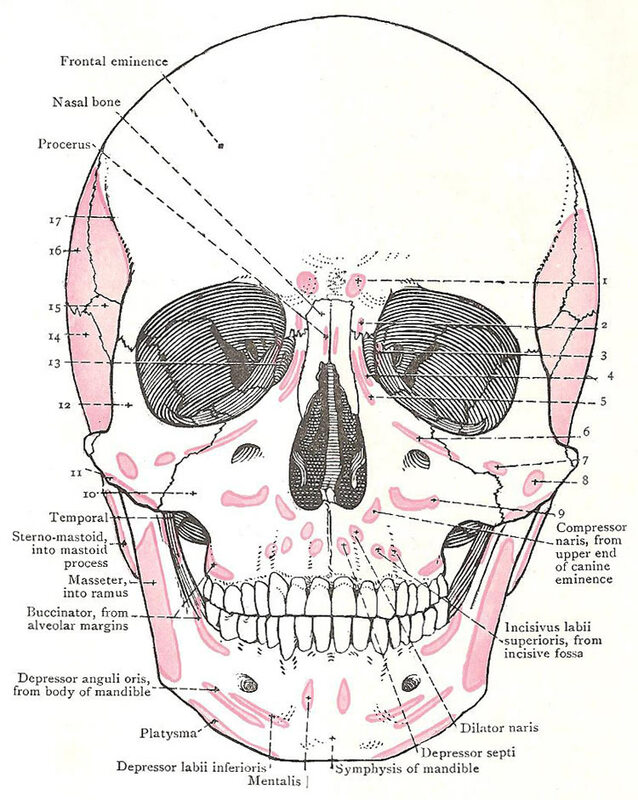 Frontal process of zygomatic bone. 13. Lacrimal bone and fossa. 14. Squamous temporal (from temporal muscle). 15. Greater wing of sphenoid (from temporal muscle). 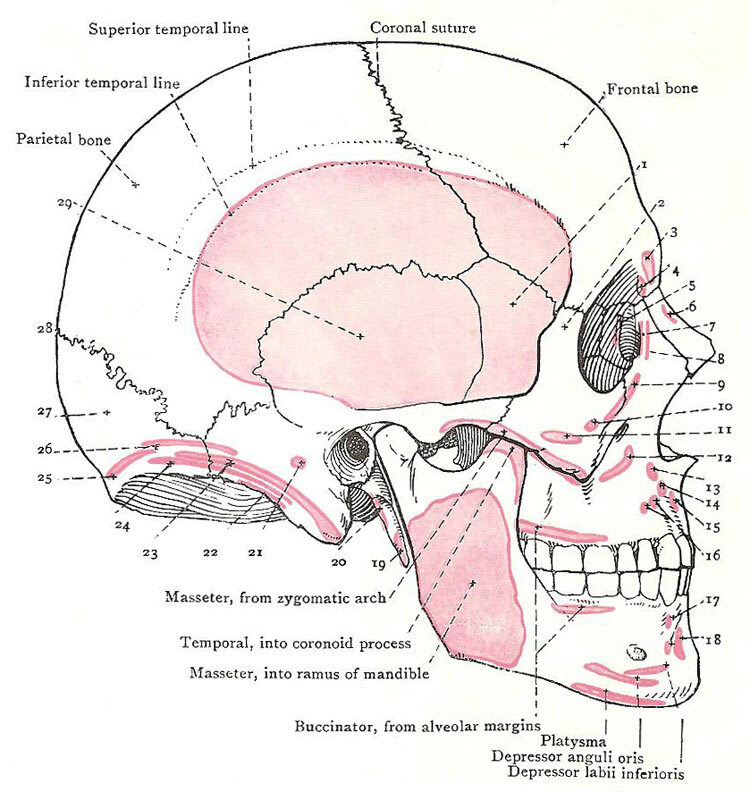 Lateral (side) view of the skull showing the places where muscles attach. 1. Greater wing of sphenoid bone. 2. Frontal process of zygomatic bone. 3, 4. Orbicularis oculi (from frontal bone). 5. Orbicularis (from lacrimal crest). 6. Procerus and nasal bone. 7. Orbicularis (from frontal process of maxilla). 8. Levator labii superioris alaeque nasi. 10. Zygomaticus minor (from zygomatic bone). 11. Zygomaticus major (from zygomatic bone). 12. Levator anguli oris (from maxilla). 18. Mentalis (from body of mandible). 19. Styroglossus (from styloid process). 20. Styrohyoid (from styloid process). 21. Auricularis posterior (on mastoid temporal). 22. Longissimus capitis (on mastoid temporal). 24. Splenius capitis (on superior nuchal line). 25. Trapezius (on superior nuchal line). 26. Occipital belly of occipito frontalis. 27. Squamous part of occipital bone. 29. Temporal muscle and squamous temporal.